The biodiversity hotspot of the North Indian state of Sikkim is under serious threat. Sikkim is an Indian state in the Himalaya’s in between Nepal, Bhutan and Tibet. The state is known for its rich and diverse flora and fauna. The landscape varies from dense green forests to the high snow covered mountains in the North. The Government of Sikkim introduced a green mission to emphasize and cherish the magnificent nature. The Sikkimese respect their environment and are developing and studying strategies how to keep economic growth and increase of tourism in a harmonic relation with nature. The Sikkim Biodiveristy Conservation and Forest Management Project (SBFP) assisted by the Japan International Cooperation Agency (JICA) initiated a series of architectural projects to set an example of how to deal with urban planning and buildings that blend with nature. One of the projects is the Himalayan Biodiversity Training Institute. The Biodiversity Training Institute aims to strengthen biodiversity conservation activities and forest management capacity. The dilemma of the creation of the institute is that while it is to counter adverse impacts of climate change and the consequential decline in biodiversity through the improvement of biodiversity conservation, the act of construction and running of the institute itself could have an adverse affect biodiversity. To mitigate these effects the design of the Institute by OIII Architects and Architecture BRIO should become a biodiversity hotspot in itself, not only becoming an educational tool itself but also adding to the local green cover. The Institute is located in one of the most fragile ecological zones of the Earth. “Life on Earth faces a crisis of historical and planetary proportions. Unsustainable consumption in many northern countries and crushing poverty in the tropics are destroying wild nature. Biodiversity is besieged. Despite their apparent remoteness and inaccessibility, the Himalayas have not been spared human-induced biodiversity loss. People have lived in the mountains of the Himalayas for thousands of years. In recent decades, greater access to the global market has increased the demand for natural resources in the area encouraged both immigration from outside. As a result, populations are growing in the most productive ecosystems, which are also some of the richest in biodiversity. Today, remaining habitat in the Himalaya is patchy. The steadily increasing population in the hotspot has led to extensive clearing of forests and grasslands for cultivation, and widespread logging. The conversion of forests and grasslands for agriculture and settlements has led to large-scale deforestation and habitat fragmentation in Nepal, and in the Indian States of Sikkim, Darjeeling, and Assam. The JICA assisted Biodiversity Conservation project therefore also aims to improve livelihood for the local people who are dependent on forests by promoting sustainable biodiversity conservation, afforestation and income generation activities. These include eco-tourism for the community development, thereby contributing environment conservation and harmonized socio-economic development of Sikkim. To enhance the global, social, and economic value of biodiversity and improve livelihoods in and around protected areas (PAs), buffer zones, and reserve forests the Department would seek to achieve this objective through the establishment and implementation of sound management plans and the dissemination of biodiversity information for promoting public awareness on the significance of biodiversity. The capacity development of the Forestry Department. The institute will be hosting training camps for short to middle long periods (2 days to on month) for staff members of the Forest Department. In addition to this as a public institution there will be possibilities created that the public in the form of school classes or NGO groups can visit the institute on selected days to inform themselves about Biodiversity Conservation. The vision of OIII Architects and Architecture BRIO is for the institute to become an educational element in itself, where the building becomes a component of the biodiversity training curriculum. By re-using and reinterpretation of local techniques and knowledge the building speaks about how human life and natural conditions can harmonize with eachother and the energy consumption of the building can be reduced by using local materials and natural renewable resources. 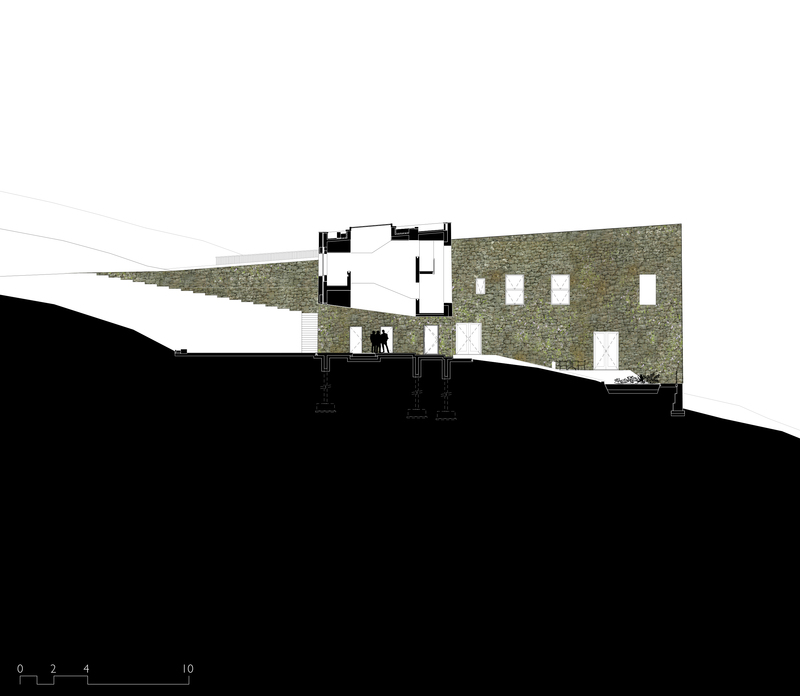 The design of the building is compact with a small footprint and makes use of solar energy, local vegetation and wind. Thermal mass of the walls will be used to create moderate fluctuations in temperature. Local material like natural stone are chosen to create accumulating qualities of walls and floors. The diverse vegetation of Sikkim will become an integral part of the building such as the vegetated roof with local plants and moss grown walls. A place for education, exchange of knowledge, to meet each other and an inspirational example of the Sikkimese ‘green mission’. The site is located near Sikkim’s capital Gantok in Pangthang, placed on a slope it faces the world third highest mountain, the Kanchenjunga. The site is sparsely vegetated with low shrubs and bushes, but more small trees on the preipheries. The site is flanked on the north by a small school, a village and grass land. To the east and west the site is defined by small seasonal streams beyond which the Forest Land continues. To the south the mountain ridge is at about …..meters . On the other side of this mountain ridge one can see Gangtok, the capital of Sikkim. To increase the benefits of the view of Kanchenjunga the institute is place on a flat plateau at a higher elevation mid way the mountain slope. Spaces like training halls, workshop space, conference auditorium, library, research labs and residential facilities will face this wonderful view. These are placed in the two arms of the U-shaped building. 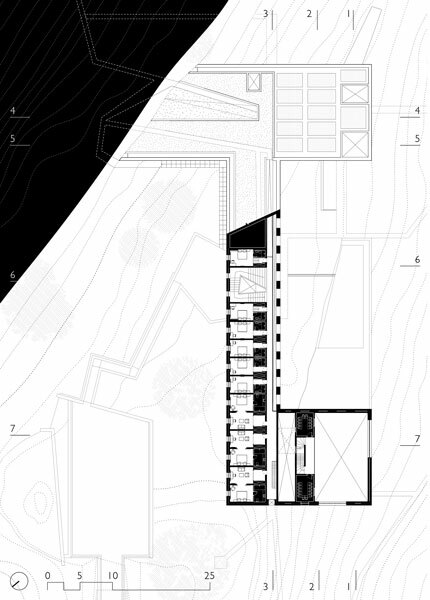 In the body of the building the residential rooms face southwards, the warmest side of the building. A road starting from the public road at the north east of the site will wind up the slope. As an experiential route the road climbs along three residences for the staff and emerge at the south side of the Institute. Once reached on the platform behind the Institute a view through the entrance hall takes one by surprise: a framed view of the Kanchenjunga. The design of the institute has a dualistic character. On one hand its symmetrical plan and its tall, road facing elevation imposes itself on the landscape as a building of public importance. This is not very different from the way the monasteries or Gompas in Sikkim overlook the land around them with their strong symmetrical forms. 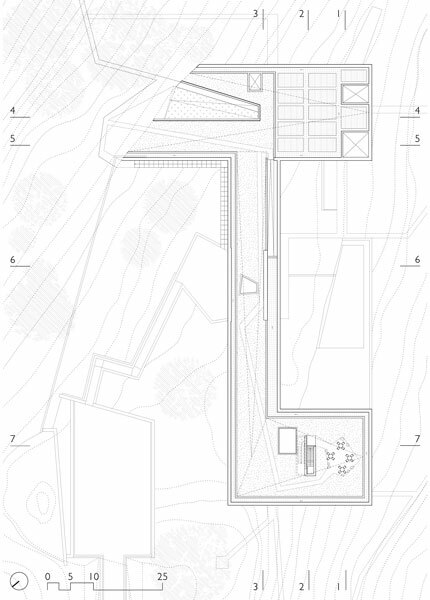 The roof has a gentle but critical slope which emphasizes the strong shape of the building. 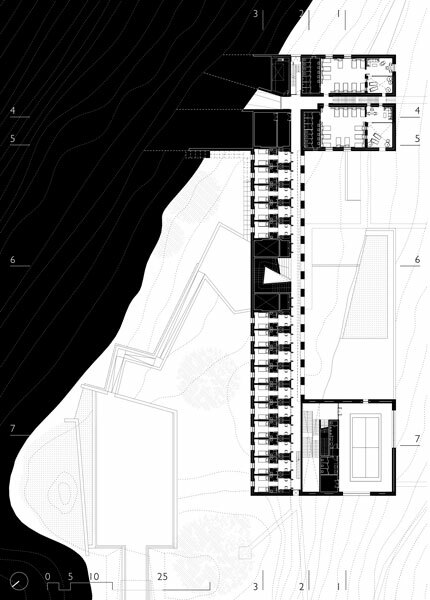 On the other hand by tugging it into the landscape as if was a sheet of rock pushed up by tectonic uplifts, the institute becomes an integrated element of the landscape. This is further enhanced, by allowing the stone walls of this ‘rock’ to be overgrown by local epiphytic species such as mosses, lichens and ferns. The building is partly embedded in the surface of the earth. A benefit of this is that the thermal mass of the earth can keep the indoor temperature naturally tempered. On one side of the building the level of the land is at the same level as the roof of the building. 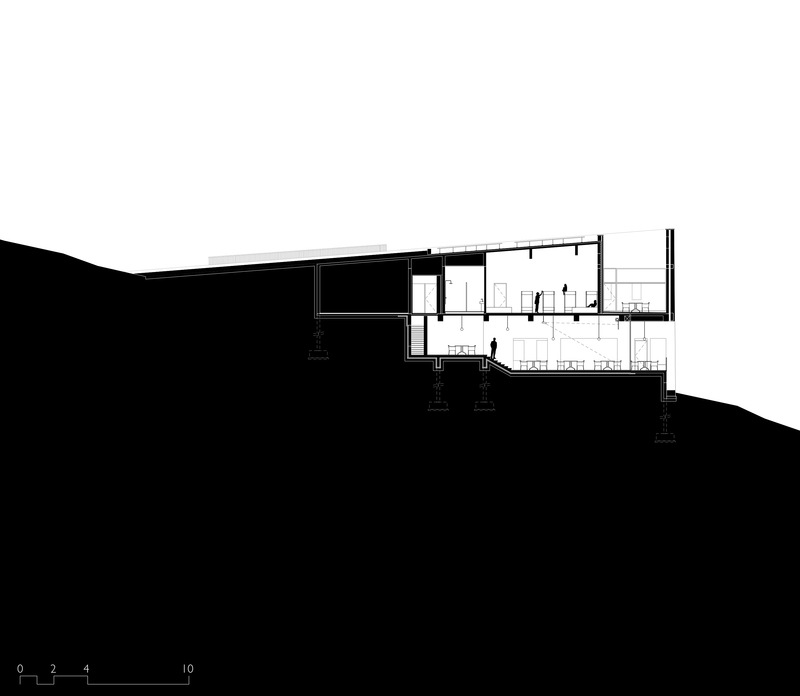 This allows the landscape as a continues surface to continue over the roof of the building. The roof becomes accessible to the visitors and becomes an important gathering platform wxith an amazing panoramic view. As a chameleon the building takes on the tones, colours and textures of the surrounding landscape, and change over time throughout the seasons and throughout the life of the building. Balancing the amount of ‘overgrowth’ on the surface of the walls becomes a part of the curriculum of the programs conducted at the institute. The Institute Building is organized as a compact U shaped building. By placing all the functions of the institute together the building organization becomes efficient. Walking distances between functions become minimized. Several rooms with common functions can be used for different purposes during the day and night. 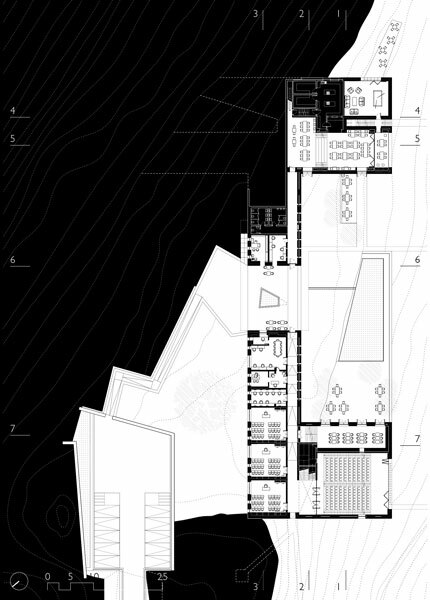 Because the all rooms are adjoining each other the amount of elevation exposed to the outside becomes minimized. This both reduces the quantity of material required and therefore cost as well as the surface exposed to external temperature changes and therefore energy loss. The Institute comprises of both residential and educational functions. For the proper functioning of the institute there has to be a clear distinction between residential and educational component. This distinction is established by placing the educational component to the east of the Entrance Hall, and the residential component to the west.the only way to go from the residential to the educational component and vice versa is through the Entrance Hall, which makes this place the nucleus or ‘heart’ of the building. The Reception of the Institute is located in the Entrance Hall. Trainees, staff or visitors will be guided from here in the right direction. Offices and class rooms of the institute are placed along a gently descending ramp to the east of the Entrance Hall. At the end of the ramp a three storey high atrium is lit from above with a skylight. A Library and Auditorium are accessible directly from this floor and a Multi Purpose Hall and Meeting Rooms are accessible through a sculpted staircase leading upwards. To the West of the Entrance Hall a partly embedded corridor leads to the common Canteen with a large covered outdoor area. The Kitchen and Store Rooms are located adjacent to the Canteen. A Common Room for the trainees is located next to the Canteen. In between the Canteen and the Common Room a staircase leads to two dormitories with individual common rooms, a terrace and attached bathrooms. From here a long and wide verandah space runs along the length of the institute. Along this common verandah, which becomes not only a place of circulation but also of leisure with astonishing views the double shared room accommodation is located. Because the roof slopes upward towards the end of the verandah there is an additional floor which accommodates two suites and several executive non shared rooms. The buildings are designed as tall, slim, tower like structures, which are placed as objects in the landscape. Not unlike the ‘Himalayan Stone Towers of Kham in Tibet they bring a scale and proportion to the landscape. They are placed along the road leading to the institute, not only for easy access but also to make the ride uphill a dynamic experience. The slimness of the towers allow for all rooms to enjoy amazing views through large window opening to the surrounding landscape. In case of the Common and Individual Staff Quarters they allow for each unit to occupy one complete floor. External staircases wind around these small towers upto the terrace which becomes and additional open air living room. Architecturally the elevations of the institute are designed to emphasize the massiveness and homogeneity of the building volume. There are in principle three types of openings. 1. The residential windows, which are determined based on climatic requirements and restricted in size to keep the homogeneity of the stone volume in tact. 3. Large windows in the common facilities positioned as a composition on the north side of the building and capturing the views of the surroundings. 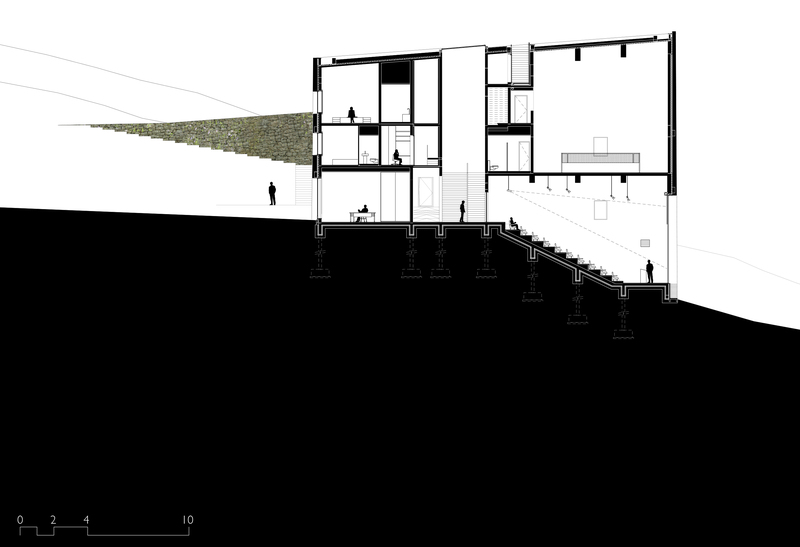 Since the Institute is a compact building, the circulation has been able to be kept efficient and minimal. Nonetheless the circulation spaces are the places of encounters and interesting conversations between people. They have been therefore designed as comfortable and generous places of movement as well as rest. The basic principle of the circulation through the institute is simple and rational. The main circulation runs along North side of the spine of the C-shaped building. On the ground floor the corridor is enclosed in between wall creating a tension between inside and outside. On the upper two floors the corridor has been opened up to the Kanchenjunga Range becoming a verandah, a semi indoor space. The internal width of the corridor is 2 meters and the study spaces of the shared rooms open up to the verandah, making it a space to informally hang around. Based on a rational principle on both ends of the corridors a staircase is positioned. This way the requirements for fire escape routes can be met. However the staircases become part of an experiential route through the building. The staircase in the Atrium of the educational wing winds up sensuously towards the skylight. The staircase in the residential wing connects over three levels the land below the institute with the Canteen, on the ground floor, the residential floor on the first floor and continued as a landscaped outdoor staircase to the roof level. From the roof level a ramp along the length of the building connects back to the upper residential floor, and via an elegant staircase positioned right above the Entrance Hall to the first floor verandah. From here one can look back into the Entrance Hall. A quick short staircase connects the first floor verandah and the land surrounding it to the end of the ground floor corridor. These various circulation patterns allow a multitude of possible routes and ways to discover the building. As in a hilly landscape there are always multiple ways (scenic ones and shortcuts) to reach the destination which prevents the institute from becoming a “prison in its own” but instead becomes an open, connected landscape of discovery and learning. The site in Pangthang is located in seismic Zone IV, the second highest in India. Therefore the structural principle for the institute is based on a simple grid system of Reinforced Concrete columns, beams and slabs. 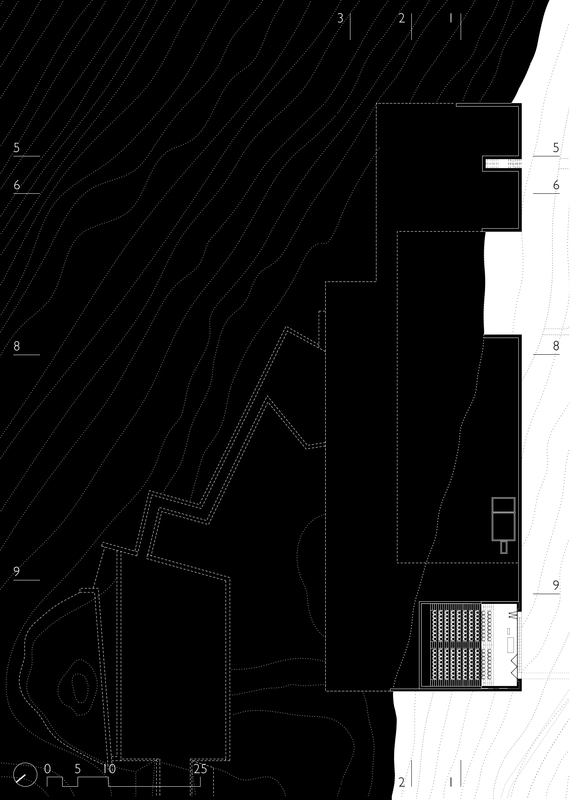 The grid size is 7.2 x 7 meters throughout the spine of the building. For the Auditorium, Multipurpose Hall and Canteen larger spans are required due to the sizes of the spaces. 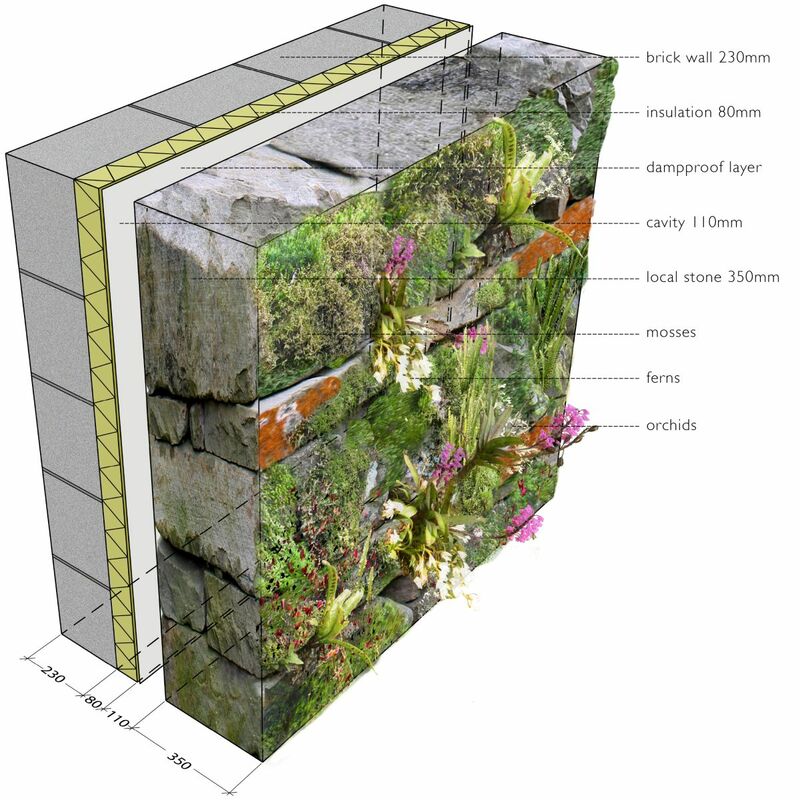 The external walls are made of multiple layers: brick, insulation a cavity and a natural stone wall. The walls are capable of bearing their own weight and are connected to the RCC frame structure. Most openings in the walls are therefore of a small size reducing the requirement of large lintels. 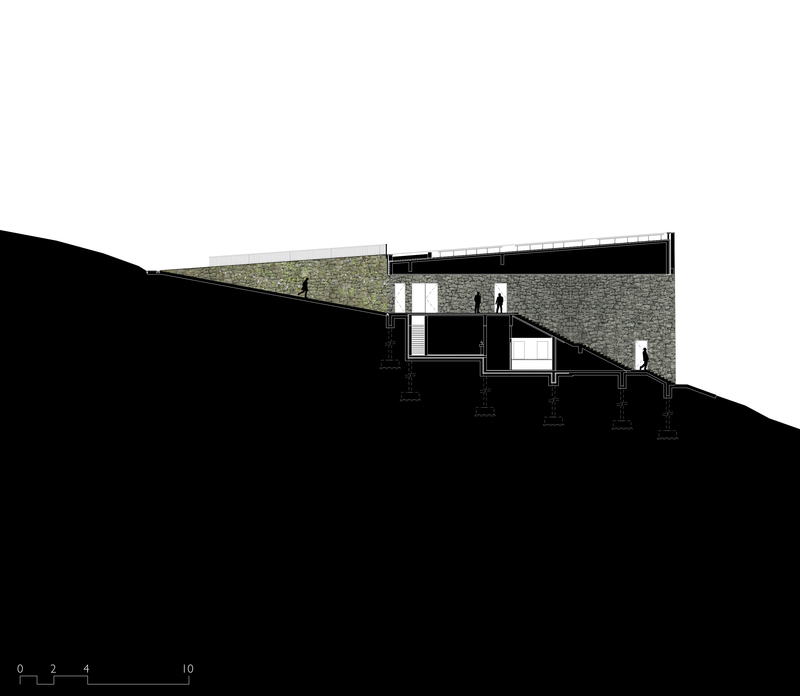 However in the important common facilities such as the Canteen, Auditorium and Multi Purpose Hall large openings in the elevation to capture the views of the surrounding mountains require more inventive structural solutions. In the region of Sikkim a rich variety of local material is available. Local natural stones, timber from harvested forests and…. Only when it is necessary to improve the durability and technological performance of the building imported materials are proposed. The interior finishes of the institute are straightforward and have an earthy feeling to it. 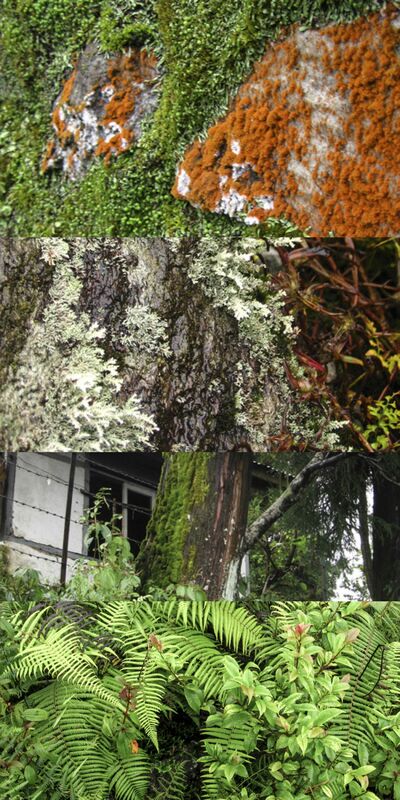 The humid climate of Sikkim is ideal for the growth of mosses. 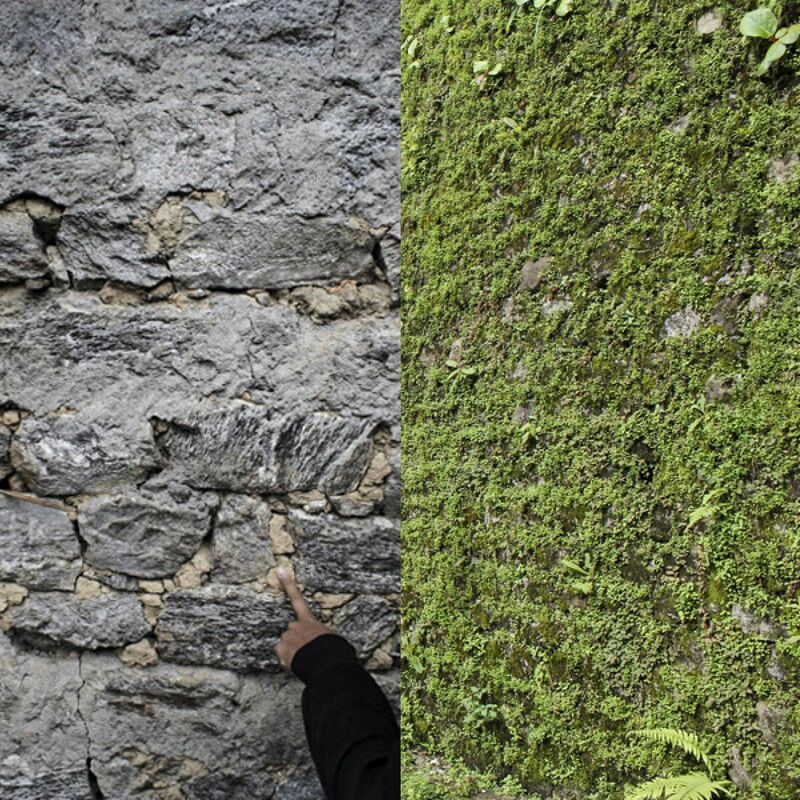 Instead of trying to keep stone walls clean, the external walls will be covered by epiphytic species such as mosses, lichens and ferns, creating an additional layer of biodiverstiy over time. The spcies are so called pioneer species. They colonize previously uncolonized land, usually leading to ecological succession. They are the first organisms to start the chain of events leading to a livable biosphere or ecosystem. Since uncolonized land may have thin, poor quality soils with few nutrients, pioneer species are often hearty plants with adaptations such as long roots, root nodes containing nitrogen-fixing bacteria, and leaves that employ transpiration. Pioneer species will die creating plant litter, and break down as ‘leaf mold‘ after some time, making new soil for secondary succession. This way the building itself becomes an instrument of education. It will become a place for education on Himalayan flora and fauna and an example environmental friendly building design. Pioneer species are species which colonize previously uncolonized land, usually leading to ecological succession. They are the first organisms to start the chain of events leading to a livable biosphere or ecosystem. Since uncolonized land may have thin, poor quality soils with few nutrients, pioneer species are often hearty plants with adaptations such as long roots, root nodes containing nitrogen-fixing bacteria, and leaves that employ transpiration. Pioneer species will die creating plant litter, and break down as ‘leaf mold‘ after some time, making new soil for secondary succession. This in itself is a great thing, for the building to be an example of the creation of a Ecosystem. Mosses create a new layer of nutrients for new species to grow on. This leads to concerns of whether the rock will slowly ‘disappear’ and whether this affects the structural stability.